Please note that the organisers have had to cancel this event. Full refunds should be available (see website). You know those C&C types you've seen every single day of the last six months pounding the streets of Cambridge, morning and evening? In case you didn't realise, they were training for the Valencia Marathon, which happened at the weekend. Results are now in, and eight current and former C&C athletes went sub-3. Amazing. Top of the pile was Tom Stevens, finishing 53rd in a world-class field in 2:24:05 and earning 29th place on the 2018 UK rankings, but arguably the most news-worthy performance came from newly-ex-C&C George Schwiening, whose 2:37:46 puts her ninth amongst domestic athletes, and a minute and change outside (and a few months too late for) the European Championships A Standard. Glory too for Axel Finke (2:38:45), Kevin O'Holleran (2:39:24), Alex Eggeman (2:43:17), Andrew Shields (2:51:06 and 25th V50), Neil White (2:52:08) and John Ferguson (2:58:48); all worthy of individual reports, so ask them about it. See George's and Kevin's Twitter feeds for action shots. Cambridge's pavements and green spaces get a breather. Well done all. On a gorgeous warm and sunny, but very breezy, morning, 10 of us went to Therfield Heath, Royston for the Harvest Trail Half and Quarter races, 4 for the Half and 6 for the Quarter. These are testing hilly trail races in very scenic Hertfordshire countryside, organised by runners for runners, and they have a deserved good local reputation. I can't speak for my club mates, but I thoroughly enjoyed my run, and I can highly recommend the event. Here are the race details for our Kevin Henry on Thursday 6 September. To recap - it starts at the athletics track at the earlier time of 7:00pm and the route is the same as it was last year. Remember to wear your club vest! As it's the final Kevin Henry event the awards will be handed out in the pavilion afterwards - so it'd be great to see as many of you there as possible! There will be a light buffet available. Finally - a reminder about car parking...there remains very little available at the athletics ground due to the building work, so I recommend parking along one of the nearby roads, or in town, and making the rest of your way on foot. As the surrounding roads will likely be busy, if you have to drive then car sharing would be a good idea. News in from Iceland, where Tom Stevens ran a superb sub-2hr30 marathon (despite a blow-up! ), to finish in 5th place overall. Congratulations Tom! See results here. Details of Haverhill RC's Kevin Henry - Thursday 2nd August at 7:30! See the attached doc for full details of Haverhill RC's forthcoming Kevin Henry at 7:30 next Thursday. As you'll see, they are hosting their usual After Party, with food, drink and a live band. Remember - every runner who enters scores a point for their club, so please turn up in your club vest. We continue to hold the top spots and it would be great to have another strong turn out. Haverhill are also holding a junior 2k race at 7pm - so please note how this impacts on car parking! 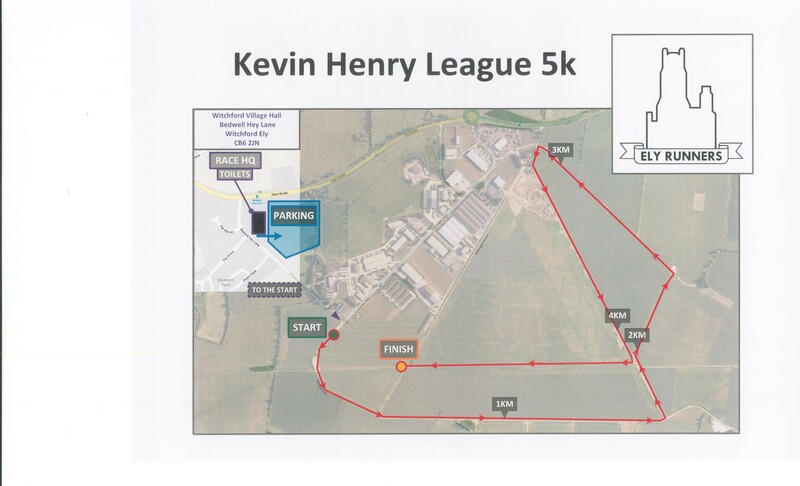 The 4th race of the Kevin Henry 5k series is on Thursday 12th July (7:30pm) at Carver Barracks Airfield, Wimbish, Saffron Walden. After the first 3 races, C&C still top the men's, ladies and combined tables, and it would be great to see a good turnout for the club again this week. Remember every runner scores a point for the club, so please turn up in your club vest and enjoy running in club colours. The course is fast and flat - road shoes are recommended, but there are some potholes and loose stones in places. Please find other instructions attached. The organisers have asked runners to arrive after 6:30pm as the airfield gates will only be open from then. The 3rd race of the Kevin Henry 5k series is on Thursday 14th June (7:30pm) at the Rowley Mile in Newmarket. After the first 2 races, C&C are top of the men's, ladies and combined table. So thank you to all those who turned out. Remember every runner scores a point for the club, so please turn up in your club vest and enjoy running in club colours. The course is a mixture of a hard, but sometimes a little loose, sandy trail around part of the race course. Please find other instructions attached. Runners will be guided to the start, which is on private land about 0.25 miles from the parking spot. Please see the course map and don't forget to wear your club vest! This years Cadecote Cross Country races will be on Sunday 1st July. C&C spectator point: Mile 22, north side of "The Highway". Feel free to exchange telephone numbers so you can get together. Nearest tube: Shadwell, St George's Swimming Pool is a good meetup point. Hope to see as many there as possible. Well done the C&C runners in the CUH&H end-of-term and pre-dinner classic. I point you in the direction of Alex’s excellent report. Happy thawing to everyone out in the weather this weekend. Final race Huntingdon Jubilee Park Sunday 11th March. Details here. Give your mother something to be proud of and get out for the final run this Sunday! Race results up for the Cambridge Half - well done everyone, but awe-struck congratulations in particular to C&C's race winner (er, no, not that one - the women's race), George Schwiening (1:15:32) and runner-up Victoria Knight (1:16:30), and to Chris Darling (fourth in 1:09:55) and Tom Stevens (sixth in 1:09:58) in the men. George in particular is in amazing form, winning all sorts of big races, and deserving far more credit than I've had the time to give. And a special mention to the excellent Will Mycroft, the men's race winner in 1:07:03 - long-time C&C, now second-claim and running for Enfield & Haringey. Apologies for not having the info for C&C's volunteer pacers in the results, and for the lack of a gun time or category information (we will have done rather well in a number of the age-groups). If you can add detail, please do. It seemed like every other volunteer helping on the course and behind the scenes was C&C - huge thanks to all of you. Thanks for all the updates so far, allowing me to present a roll of honour for our category winners Tom Stevens (M35), Sullivan Smith (M40), Victoria Knight (F40), Charlie Wartnaby (M45), Mary Twitchett (F55) and Charlie Ritchie (M60), plus George (F20) of course. Congratulations all. Given today’s unfortunate national news coverage, it might be a good time to remind users that this site doesn’t tolerate or condone unauthorised number-swapping, and to thank you all for thoughtfully desisting up to now. As I'm sure many of you will be aware, most, if not all parkruns in the vicinity of Cambridge have been cancelled tomorrow. Check on the parkrun cancellation page here for details or possibilities. Message from Glyn: in view of the weather forecast, Thursday's road session is cancelled. • Beginners running group: cancelled tonight. In view of the University closing the Wilberforce Rd track today, the beginners running group will not operate tonight. The university have taken the decision to close the Wilberforce Road centre for safety reasons due to the snow and ice. Please do not attempt to use the facility. The next Frostbite is at Hinchingbrooke Park on Sunday 18th Feb. 11.00 am start for seniors and 10.15 for juniors. We had a decent turnout at the last match from seniors and need a few extra points to move up the league. It's a good run out for juniors from U11 to U15. Come along if you can. This is a replacement event for the one cancelled before Christmas. It promises to be a course with everything. Directions and car parking are here. The next Frostbite fixture will be on Sunday 4th February at Nene Park, Peterborough. The junior race starts at 10:15am and the senior race at 10:45am, owing to another event taking place in the park later that day. All welcome, just bring your club vest. Trail shoes probably best but there are some on-tarmac sections of the course. Post for lift requests on the Endurance Runners section on Facebook. After a fantastic turnout at the first 3 races we are still doing well in the league, so will be great if we can get as many out as possible again. The re-scheduled race 3 will take place on Sunday 18th February (Hinchingbrooke Park). Thurs 1st Feb, 7-9pm, at Anglia Ruskin University (YOUNG STREET BUILDING - further up East Road). Part of a series of England Athletics endurance workshops looking at specific areas for endurance coaches and athletes. This workshop will cover nutrition and hydration - recovery, performance and lifestyle relating to endurance athletes. In case you missed the results from the Frostbite at March, they're now up. We didn't field any juniors (an ongoing mystery to me), but had a very healthy senior turnout for what is a fair hike across the fenland. By some freak of nature, the wind didn't blow and the mud was mostly firm (climate change deniers, explain that one!). Matt Fox was a brilliant third, but probably won't mind if I single out George Schwiening's first place in the female race, and an astonishing sixth overall, as the highlight. A so-so eleventh place in the match score for C&C leaves us sixth in the table. February is a big month, with the rescheduled Hunts AC race at Hinchingbrooke on the 18th, but first up is the trip to the superb woodland course at Bourne on the 4th. Mark the dates. Apologies for failing to report on the County Championships. Results are now in, thanks to my mystery correspondent (who may well be Ian R? ), and it was a white-and-blue party, with wins everywhere. New County Champions are Isaac Morris (U13), Ellie Loosley (U13), O J Parmenter (U15), Alex Hampson (U20), Glyn Smith (V70), Thomas Keen (U17), Victoria Knight (Senior & V35) and Joan Lasenby (V55). Three clean-sweeps of the podium places this year; in the past, it's been the girls, but this time it's the boys - under 13, 15 and 17. Numerous other podium positions and countless fine performances - see the results listing for the full glory. Just a reminder that it's the fourth Frostbite race (although #3 was postponed) on Sunday 14th January at HMP Whitemoor, March. The junior race starts at 10:15am and the senior 11am, and there will be some people leaving from the track. Probably best to post on the Endurance Runners section on Facebook for lift requests. All welcome, just bring your club vest and wear trail shoes. After a fantastic turnout at the first 2 races we are still doing well in the league (Hinchingbrooke has been rescheduled), so will be great if we can as many out as possible again. It is a great course, with a mixture of farm track and trail. Parking instructions attached. See you there!